Before removing the cover, consider cleaning up your poolside area. You may have leaves and other plant debris scattered around the pool which could find their way into the pool if it isn’t cleared. Likewise if there are trees or plants that overhang the pool, consider pruning them back to reduce the risk of flowers or leaves being shed into the water. If you are unsure of the best way to remove your winter cover, see our guide to different types of cover here. Clean it by sweeping and hosing it thoroughly. If recommended by your manufacturer, use a cleaner or treatment as appropriate. Allow the cover to dry completely. Roll it and wrap it in plastic. Your cover should be stored somewhere dry and where any pests can’t get to it. If you used a specific flotation device to stop the pool surface from freezing over during the winter months, remove it from the pool and store with the cover. Remove any freeze plugs or other items installed to protect your pool against freezing. Re-attach any light fixtures you removed at the end of the last season. If necessary, clear out any debris that has made it into your pool using a net or vacuum. Use a hose to add water until your pool is filled to its normal operating level. You should also check the filter and pump for any damage they may have sustained out of season. If you are unsure about anything, consult your local pool service engineer. Once you’re sure the filter system is okay, start it up and allow the water to circulate for 8 – 12 hours before moving on to the next stage. Add chemicals as necessary to balance the water chemistry. You can find more information on testing your pool’s levels here. It may be worthwhile taking a sample of your pool water to a pool professional for a complete analysis, they can then recommend any additional stabilisers, conditioners or algaecides which your pool may benefit from. Once the water levels are balanced, superchlorinate your pool with chlorine or a shocking agent. Allow the filter to run for at least 24 hours before re-checking the chlorine levels. It is important to ensure that chlorine levels are within their safe zone before allowing anyone to enter the pool – if you are unsure contact a pool service engineer for advice. Re-attach securely any features removed for the winter, such as ladders, rails or diving boards. Consider using a cleaner to put the shine back into the tiles or pool liner. If you do not have any pool tile cleaner, baking soda can be a good, cheap alternative. The water in your pool should now be sparkling and clear! With a little bit of maintenance it should stay this way so you can enjoy it for the entire summer. For more information on maintaining and servicing your pool from here check out our guides to daily, weekly and monthly pool maintenance. Did we miss anything that you normally do when opening your pool for the summer? Let us know in the comments box below. 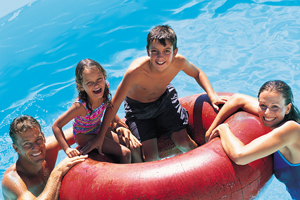 To contact a local pool service engineer, click the buttons above to the right or click here.